CHICAGO (HJ) - American Airlines announced a cost savings measure today that has passengers up in arms and they are literally not taking it sitting down. Airlines have been cutting fuel costs by reducing weight on planes through baggage restrictions and cutting back on provided amenities such as food and blankets. Courts have struck down attempts to charge passengers by the pound so a different route was required. 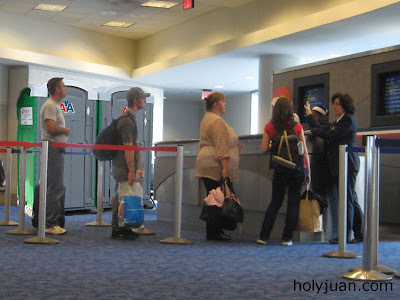 In a drastic effort to cut down on plane weight, American Airlines is requiring that all passengers use the bathroom before boarding the plane. Special porta-potties are being brought into Chicago’s O’Hare International Airport for a trial run of the elimination requirement. Passengers are instructed on how to use the porta potty measuring device. Passengers must use the facilities at least twenty minutes prior to leaving and will not be allowed to board unless they have “tried to go” at least twice. Receipts are provided at the facilities for proof of deposit. As a bonus, passengers who eliminate more than two pounds of waste will receive a refund for every additional six ounces deposited. Mark Crawler of Byhalia, Mississippi has taken full advantage of the situation, “I ate like a champ last night and made sure I had bran flakes and a bunch of coffee this morning and wah-la, $25 in poop-ons”. The test program will continue though the end of this year. I LOVE it! I knew it would come to this one day. The problem with this is that someone from AA may read it and think it's a good idea. My favorite HJ post yet! This is only a half-measure. True equality will be achieved when they charge by the pound like Fedex. this is hysterical...hopefully it remains in the "hysterical" catagory and doesn't become reality!